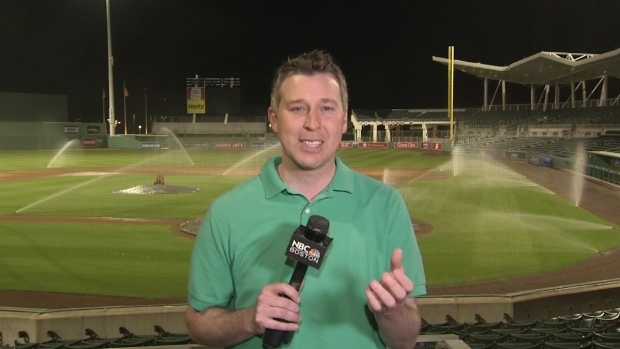 Red Sox pitchers and catchers began their first full workout of spring training on Monday in Fort Myers. When the Boston Red Sox started to report for spring training Monday, David Ortiz was missing. For the first time since 2002, Big Papi is not on the roster. "It's going to be different," second baseman Dustin Pedroia said. "He's been here every year that I've been here. We just have to find a way to overcome his absence and it's going to have to be a team effort to find a way to do that." Ortiz retired last October after helping Boston win its first three World Series titles since 1918. He hit 541 home runs in 20 major league seasons and decided he didn't want to put himself through another season at age 41. When the Boston Red Sox started to report for spring training Monday, David Ortiz was missing. For the first time since 2002, Big Papi is not on the roster. Hanley Ramirez took over Ortiz's locker, the one closes to the exit to the players' lounge and cafeteria. He also is expected to also take over the majority of Ortiz's duties as designated hitter, with Mitch Moreland also getting some at-bats. "Nobody is going to replace Ortiz," Moreland said. Ortiz led the AL with a .620 slugging percentage last year and hit .315 with 87 extra-base hits and 127 RBIs. Moreland, who signed a $5.5 million, one-year deal with Boston after spending the past seven seasons with Texas, had 43 extra-base hits and 60 RBIs last year. Ramirez, in one of his best power seasons since 2008, had 59 extra base hits and 111 RBIs. "No matter who was available to us, we were never going to be able to replace David," Red Sox manager John Farrell said. "What he has meant to us with his production, I don't know that you can just pencil in 30 and 100 as frequently as we did with David." Outfielder Mookie Betts will miss analyzing opposing pitchers with Ortiz during games. "I'm sure it'll be weird. I've never played without him," Betts said. "He had experience that none of us young guys had. The laughing, the joking and whatnot, and that leadership. We've got some guys that can do that but nobody is David Ortiz." Much of the veteran leadership could fall on Pedroia. When asked about assuming Ortiz's role as the ``elder statesman'' in the clubhouse, the 33-year-old shrugged it off. "Obviously I'm going to miss him. We are all going to miss him," Pedroia said. "I'm sure if I need some advice, I still have his number. He's not going anywhere. He'll always be on our side and will be a big part of what we do."